If you're looking for a simple and effective way to advertise your business, you should purchase a custom sign from us. We offer all sorts of signs, including a custom LED display. Our truck lettering service allows you to convert your vehicle into a moving billboard. Wherever you go, you will attract plenty of new customers for your business. If you're looking to mass-produce a t-shirt that will promote your company, screen-printing is definitely the way to go. Our services are so much faster than you attempting to do it yourself. Create a sign that's perfect for your business. 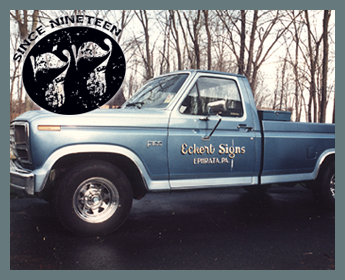 Eckert Signs, Inc, serving Lancaster, Pennsylvania, promotes businesses by creating all types of custom signs, such as electrical, wood, aluminum, corrugated plastic, and more. We also handle screen-printing, truck lettering, and vehicle wraps. Our signs promote brand name recognition, no matter what form you choose. Our founder, who had a background in construction and a love for doodling and pin-striping vehicles, opened the business in 1977. As the revolution of computerized lettering began, our founder purchased a computer that cut out letters in vinyl material with a tiny, precision knife. Fast forward to today, and our once hand-painted artwork and lettering is now created by digitally printed photos and computer generated graphics. 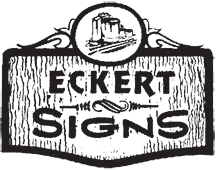 In 2015, Eckert Signs was sold to a new owner, who had worked at the company for over 20 years. Our founder wanted to retire, and the new owner purchased the company in order to ensure we still provide great customer service and quality craftsmanship. All of our customers receive the sign they are looking for — to their exact specification. We give personalized attention with high quality craftsmanship, and we work with construction companies, builders, plumbers, electricians, and many other industries, as well as individuals. If you're looking to catch the eye of potential customers through unique signs and truck wrapping, we can help! Our eye-catching graphics are perfect for promoting businesses and leaving a lasting impression. We can help you with the concept and artwork, or we'll work with your design team to generate the best possible end result. Our clients also include businesses, churches, schools, nonprofits.